Babbitt will succeed Tom Renner in the sports information capacity. Renner has served in a dual role as director of the college's public, community and sports information programs since 1967. He will continue to oversee the public and community relations responsibilities. "We are delighted to have Alan join our college advancement staff," said David Vanderwel, interim vice president of college advancement who chaired the search committee that attracted nearly 150 candidates. 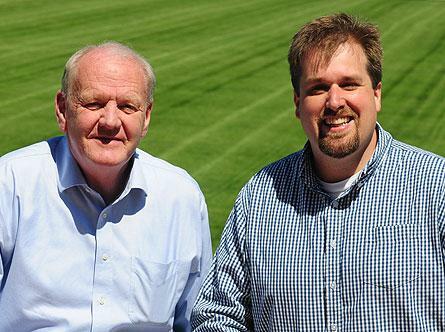 "Alan's professional expertise and his knowledge of Hope athletics and appreciation of the mission of the college will allow us to sustain the highly respected sports information program developed by Tom over the past six decades," he continued. "I am humbled and excited to be chosen as the first full-time sports information director at Hope," Babbitt said. "I have enjoyed my time covering Hope men's and women's teams as a media member in West Michigan for 15 years and getting to know the athletes, coaches and administrators both on and off the playing field. Babbitt has served as sports editor of the Holland Sentinel since 2003. He previously was a sportswriter with the Grand Rapids Press and Advance newspapers. In 2011 he was honored by Gatehouse Media, owner of the Holland Sentinel and more than 300 other daily and weekly newspapers, as the runnerup in its sports writer of the year recognition program. He has received honors from the Michigan Associated Press Editorial Association and the Michigan Press Association, including coverage of Hope's 2010 NCAA Division III women's basketball national championship run. He is a 2000 graduate with a BS in journalism from Grand Valley State University. He and his wife, Krista, have two daughters, Madeleine and Elise. The Babbitts live in Holland.